Watch how The former Arsenal midfielder came in hard on Messi trying to stop him. Barcelona entered the return leg of their Copa del Rey semi-final clash against Valencia with the slimmest of margins. Luis Suarez’s goal in last week’s first leg handed the La Liga leaders a 1-0 advantage but Ernesto Valverde would have reminded his players that the job certainly wasn’t done as they prepared to play at the Mestalla. Valencia are currently third in La Liga and held Barcelona to a 1-1 draw at their stadium in November. But any team that features Lionel Messi is in will always be the favourites, no matter where the game is played. And the Argentinian maestro got off to an incredible start in the return leg, sending Valencia’s players to the floor as early as the 10th minute. He produced an amazing run in the opening stages but the best part came when he met Francis Coquelin. 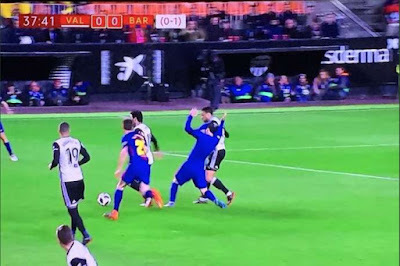 The former Arsenal Midfielder came in hard on Messi and ended up pulling the Argentinian’s shirt over his head in a rather bizarre moment.